Where do you start when you try to describe Roomful of Blues...? With a band that has existed and evolved over 50 years of history, that has had 48+ band members throughout the years, and has amassed an amazing (and well deserved) list of awards and accolades. It's a challenge to find a starting point that is remotely sufficient to the task of describing or even attempting to review such a talented group of musicians! In fact, this review is rather late because I've had trouble starting it for just this reason. I only hope that I succeed in conveying just how amazing they are! Currently under the leadership of Chris Vachon (guitar) and fronted with Phil Pemberton on vocals; the band has an amazing history and sound. It's endured and grown better and better. 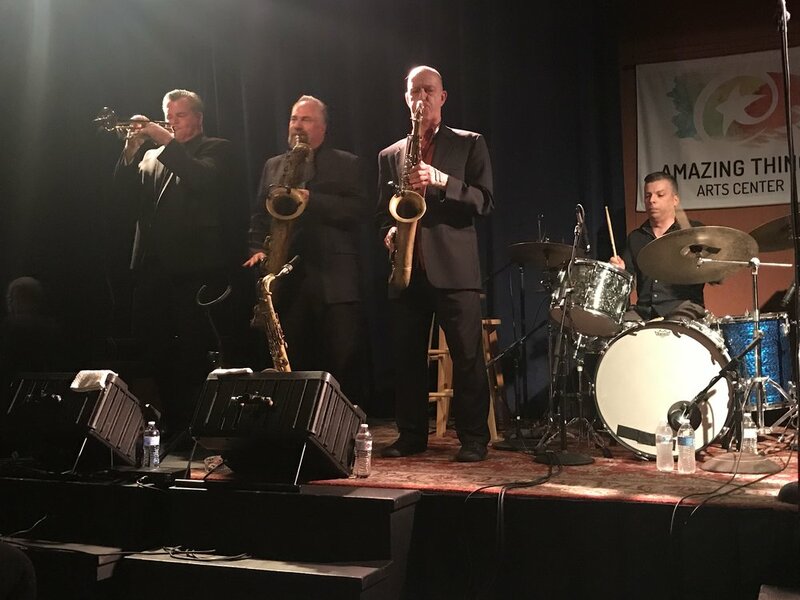 Rounding out the band to date are Carl Gerhard (trumpet), John Turner (bass), Chris Anzalone (drums), Mark Earley (baritone and tenor sax), and Rusty Scott (keyboards). This was my first chance to experience first hand the talent and polish of a band that hasn't lost a step in more than five decades of existence. They smoothly moved from jump to swing, to classic, to contemporary, to New Orleans, to boogie, and around to raw electric. Every inch of it feeling natural and right. Having not had the pleasure to see the band play live before I wasn't exactly sure what the experience would be like, but all those awards and the bands longevity had to say something, right? It turns out it didn't say nearly enough! For me it was like taking a fun walk through the history of the Blues from the 30's/40's all the way to current. I particularly enjoyed the sweep through New Orleans. Phil truly has a stage presence that matches his smooth and soulful voice, which to me leant an air of the old club bands that existed in Chicago, Memphis, and the Rat Pack days of Vegas during their heyday of the 40's through the early 60's. An odd mix I suppose... I mean Vegas?! Really?! Yes, really. And it works. Oh man, does it ever work! The phrase or description that stuck in my head was that Phil truly "leans into the music." Both physically and vocally. And that band is more than ready to lean right with him. The horn section truly reminded me of B.B. King's band, in their finest attire with smooth professional execution of precise and improvised music carrying the whole band through like a living and breathing single entity. Chris Vachon can truly take an electric guitar and bring a full round melody into a song with a practiced hand and a passion driving it, and then flip it on its ear and jump into full electric glory that somehow shreds and heals the guitar all in the same note. Rusty Scott surely has his hands full going between electric to traditional and around to a blend of keyboards and piano that I'm not sure I understand how anyone can be that fluid and solid. I get the feeling he could walk a tightrope 200 feet in the air without a net while doing brain surgery and send the patient home with a masters in astrophysics! And he does it all quite masterfully! I had the chance to talk with the guys before they went on and I have to say, knowing the history and reputation as great musicians, I was nervous! But they truly are a charming group with a wicked sense of humor to match. Something that shows through on stage as well. With a range of ages to the members you get to see how the Blues truly unifies a community. The Blues are not limited to one demographic in any way, nor is it limited to a single genre. The Blues come from all walks of life in many shapes and forms, and with Roomful of Blues you get to see a microcosm of exactly that... Different ages, histories, instruments, schools of experience, and unique gifts on full and glorious display with this legendary band! The roots for all modern music are evident throughout. And it's something that is clearly evidenced as a responsibility that the band takes seriously. Roomful of Blues are the perfect experience to take a trip away from whatever life is throwing at you and instead getting to just smile and heal through a music that I believe, and have heard from multiple artists of a multitude of types say is "pure honesty." Honesty in life, love, hurt, and joy. With the work I've been doing for a video project for this site I've heard something echo'd, and I honestly hadn't heard it put into just these words before and then I kept hearing these words... "no one comes to hear the Blues to be sad, they come to hear the Blues to have a good time and heal!" (I'm paraphrasing obviously.) Tommy Castro was the first artist I interviewed that put it into such a specific phrasing that suddenly I could hear the same message in similar answers from artists who cut across different forms of the Blues. Well kids, Roomful of Blues are definitely a place to go heal and have a good time! I can't wait for my next chance to see these guys live, and you SHOULDN'T wait! Take the whole family! It's a fantastic night of music and fun! Take a look at their Events Page Here and their band site HERE! *This review was not solicited by the musicians or venue.